Prior to the settlement of the area by Europeans, the area of what is now known as Wedderburn was occupied by the Dja dja rung aboriginal tribe. The well known explorer, Major Thomas Mitchell, was the first white man known to have visited the area on his third expedition in 1836. A cairn commemorating his visit is located approximately 5 kilometres south of Wedderburn on the Calder Highway. In 1840 the first squatter to take up land in the area arrived. His name was John Catto and his run covered some 64,000 acres or nearly 27,000 hectares. Subsequent to this there was a rush for land all through the area and many runs were taken up by various individuals. Gold was discovered in Wedderburn in 1852. The most popular story regarding the find is that a shepherd named Brady found gold while looking after sheep. Apparently he wasn’t particularly interested in the find and passed the information on to some prospectors from South Australia travelling through the area. The area where the first gold was found is located on the St Arnaud Road approximately 3 kilometres from Wedderburn. The site now boasts a sign “Brady’s Find”. Although the South Australians tried to keep their find secret, word leaked out and by December 1852 there were some 6,000 people in the area looking for gold. The population dropped sharply in 1853 due to a lack of water to wash dirt with and the discovery of other goldfields. The population gradually dwindled, particularly after the 1890’s although there have been several times when further interest has been generated in the Wedderburn goldfields. Of these, one of the most significant was in the 1950 when Bert Smith dug a hole in Wilson Street in the town and discovered a nugget worth ₤1,100 ($2,200). Needless to say, this sent the town into a flurry of activity and many people began digging up their gardens and backyards in the new gold rush. Not long after Smith’s discovery, news got around that Dave Butterick had been digging in his backyard, also in Wilson Street for three years and had discovered several large nuggets. The nuggets were named “The Golden Retriever” worth ₤1,300 ($2,600), “The Wedderburn Dog” weighing in at 145 ozs and the “Golden Wedge” weighing in at 70 ozs. In April of 1950 some 8,000 people are reported to have visited the town to see the nuggets on display. 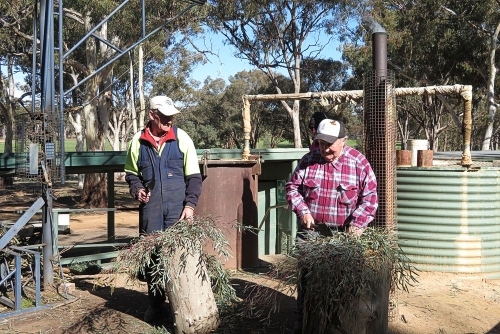 Gold is still found in Wedderburn today and many hundreds of prospectors visit the area each year. There is abundant public land in the area where detector operators can search in the hope of finding that elusive nugget. Wedderburn Tourism is a voluntary committee that strives to make Wedderburn a more pleasant town for people to live and visit. This committee meets the last Monday of the month at the Wedderburn Community Centre 24 Wilson Street Wedderburn. 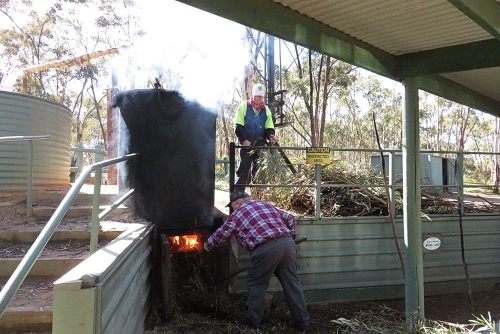 The main priorities of the committee is the Wedderburn website, Hard Hill Tourist Reserve that includes the working eucalyptus stew pot and the RV Friendly campsite and the Minelab Wedderburn Detector Jamboree held annually on the Victorian Labour Day Long weekend. This committee conducts pre organised coach tours for the 50+ market and organises Educational Tours learning about the traditional Australian Gold Rush History. Come and join the group even if it’s only to socialise. Open seven days a week, excluding Christmas Day, Good Friday & Anzac Day. ©2018 Wedderburn Tourism. All Right Reserved.